On this page I’m going to take a detailed look at a back-lock to slipjoint conversion I have completed. In this instance, for a knife I’m using to test the performance of CMP S110V steel. This article will cover a few options you have for the conversion and how to get the function correct (and how to get it wrong). Once completed the knife should operate exactly as a normal slipjoint knife with a sprung ‘snap’ into the open position and reasonable resistance to closing. Only the back-lock type of lock is suitable for this conversion as it has the most similar layout to a slipjoint. Why Convert a Back-lock to a Slipjoint? 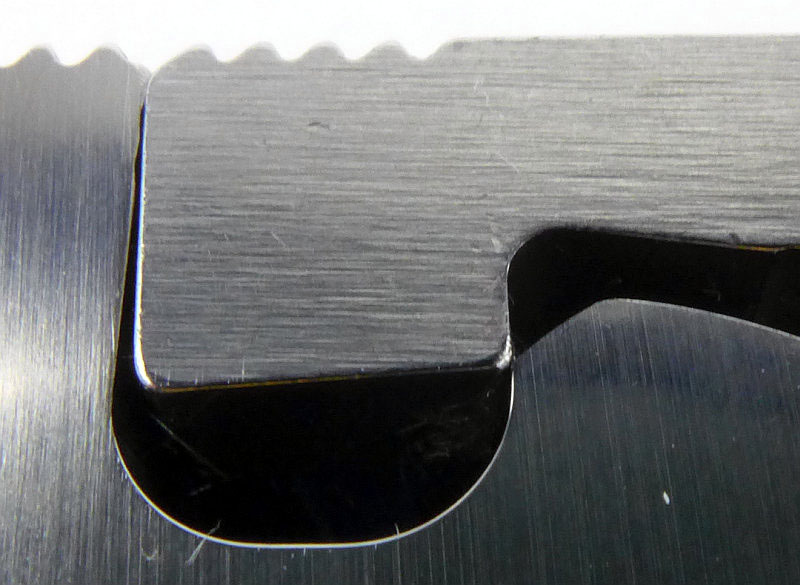 A valid question as the lock is an important safety feature of folding knives. The only real reason to carry out this conversion is if your local laws require that only non-locking knives can be carried and the knife you wish to convert has a suitable blade/cutting-edge length (so that once converted it meets all requirements for carry). 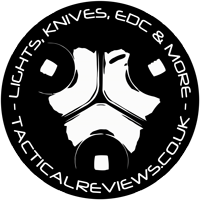 I live in the UK and for EDC must choose a non-locking knife with cutting edge no more than 3″. The Spyderco Native 5 with CPM S110V steel I wish to test is ideal, and as will become obvious, is a great knife to convert as its design makes it easy to work with. Here the Native 5 has had one side of the stepped pivot bolt opened plus the two handle screws removed allowing one side of the handle to be removed. First we need to understand what we are trying to achieve. 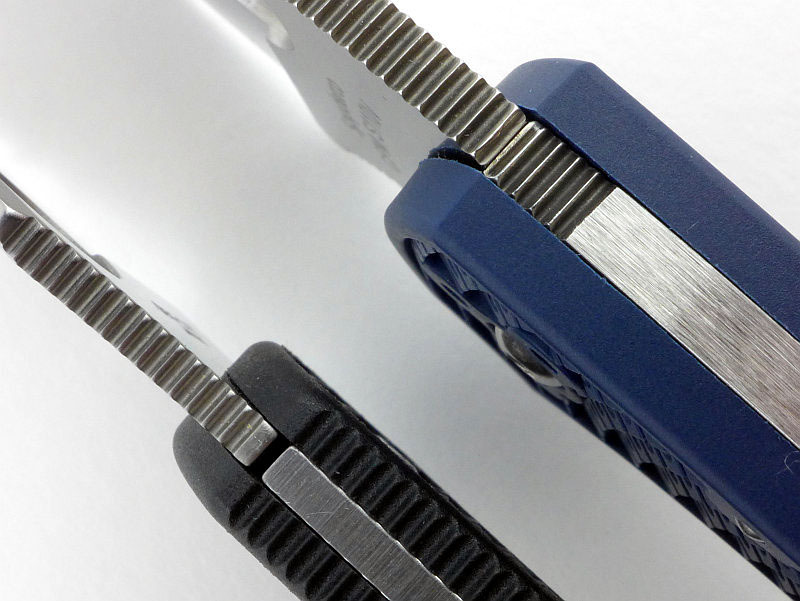 The actual aim is to effectively only just ‘break’ the lock so it no longer catches and holds the blade securely. 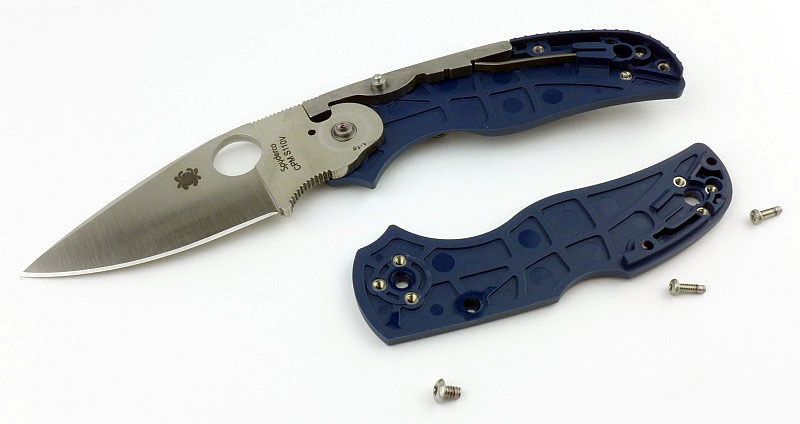 ‘Only just’ is the critical factor here for a good slipjoint conversion. Be warned that it does not take much more metal to be removed to turn a good conversion into a bad one. This is an overall view of the lock mechanism of the Native 5, and this is a typical back-lock. The lock consisits of a hook machined into the blade tang, a pivoting locking bar and spring to keep the locking bar pressed onto the blade tang. Moving in for a closer look at the actual lock parts that hold the blade open, the blade tang ‘hook’ and the lock bar. To break the lock we need to remove some metal. This could be from the hook or lock bar, or both and we need to consider these options. Firstly the ‘both’ option can be eliminated. The function of the resulting slipjoint relies on the contact points of the lock bar and blade tang hook remaining virtually unchanged. Removing metal from both parts makes this very unpredictable, so let’s focus on only one piece being modified. Of the two options, the lock bar might appear the most attractive as it will not be as hard as the blade hook (so easier to work with), but this makes it more likely you will remove too much metal and this part is not as accessible as the blade hook. 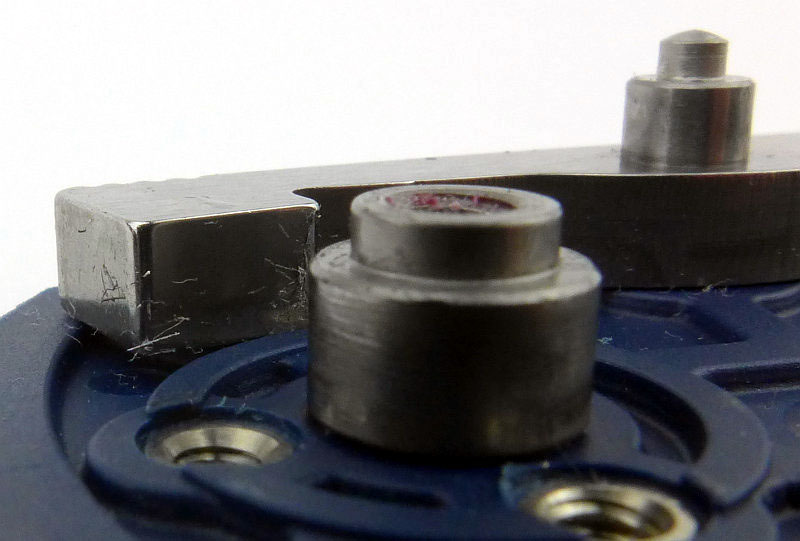 Though the blade hook is fully hardened, there are two benefits to removing material from this. The first is actually that you can (with care) work on the blade hook with a fully assembled knife. It will take you longer, but means you only need a suitable diamond file and some masking tape. The second is that being harder means you are far less likely to take away too much metal, even with diamond files. Having decided on the blade hook, the next consideration is the angle to cut into the hook. The green line represents the engagement surfaces of the working lock, and the other lines are increasing angles requiring more material to be removed. As you will see, the red line is closest to the angle I have worked with and seemed to still give a good closing force. 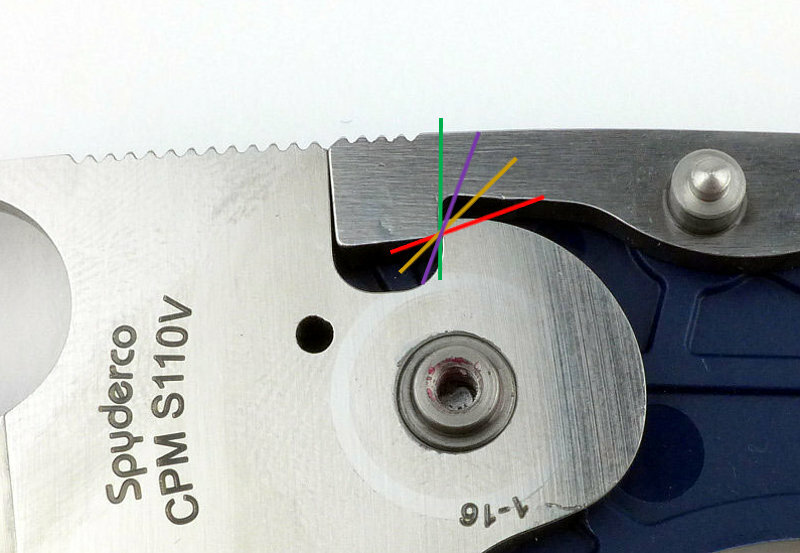 The purple and orange lines make the required closing force much higher putting a lot of strain on the pivots as well as making the knife less ‘slippy’ and more likely to be questioned if it really is a non-locking knife. The Native 5 happens to be a fantastic knife to work with as the lock bar pivot and blade pivot stay in place on one side of the handle . 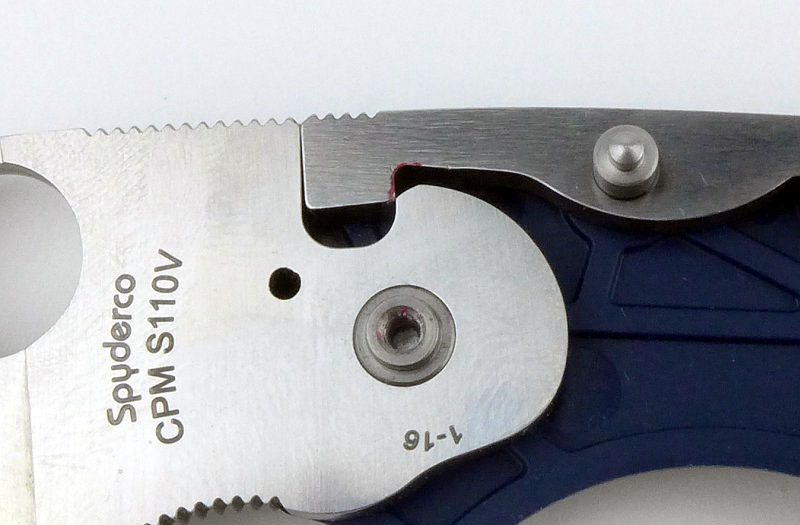 This allows for full access to the blade tang when removing the blade completely and rapid reassembly to test the lock. To start with I mark up the material I can remove quickly with a red Sharpie pen and you can see some of this red ink on the lock bar. After starting this process, here we are left with around 1mm of lock surface still engaging. Now we are getting close, but even with minimal lock engagement the lock-up is still rock solid. DONE! 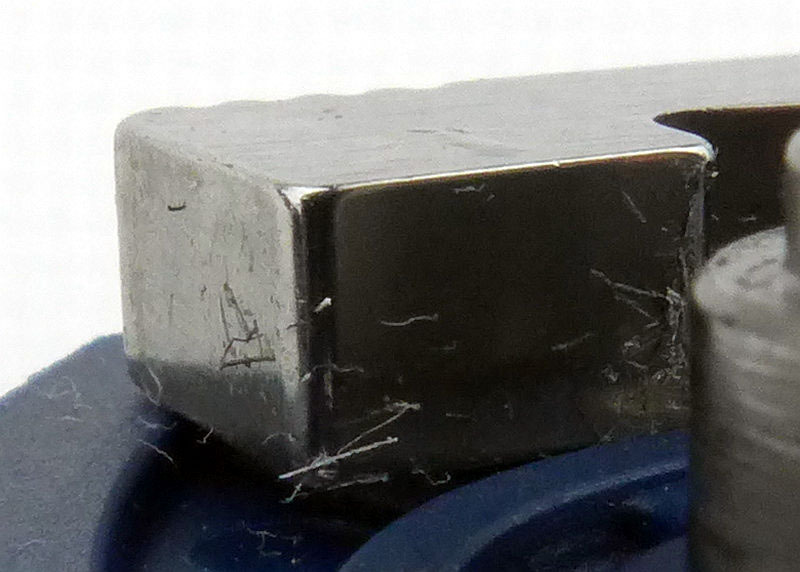 The lock is just failing to catch, but the two contact points of the lock bar and blade tang are still there. Slightly premature in saying ‘done’ as when reassembling the handle, the lock bar pivot more secure as it is now held at both ends, and the lock started to catch again. I needed to disassemble the knife, remove more metal, assemble and repeat three times before the lock failed to hold. 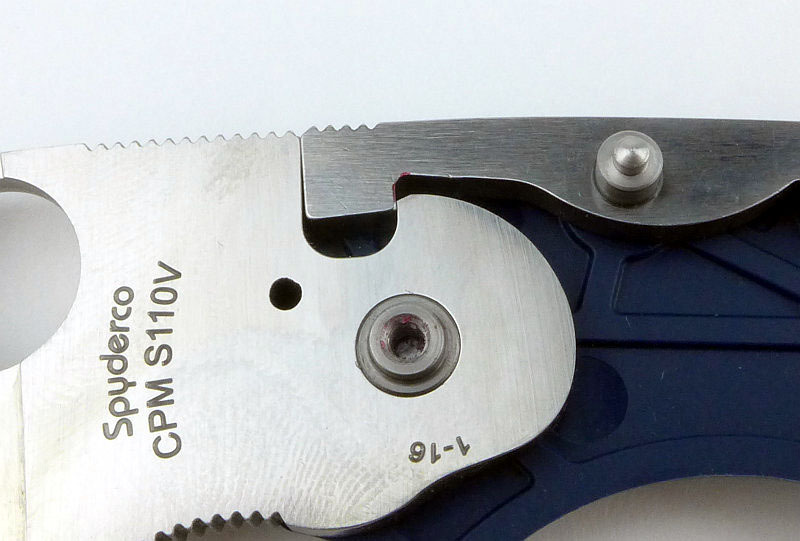 A close look at the contact points of the blade hook and locking bar. To remove the gritty feeling of the slipjoint, I used a fine ceramic stone to improve the reshaped surface. You can still see the deep scratches from the diamond stone used, but he surface is improved enough to give a smooth action. An observation I would like to pass on relates to that first point of failure of the lock. To get the blade to close without touching the lock bar at all, initially requires a very firm press on the back of the blade. After this, the action becomes much easier and smoother. 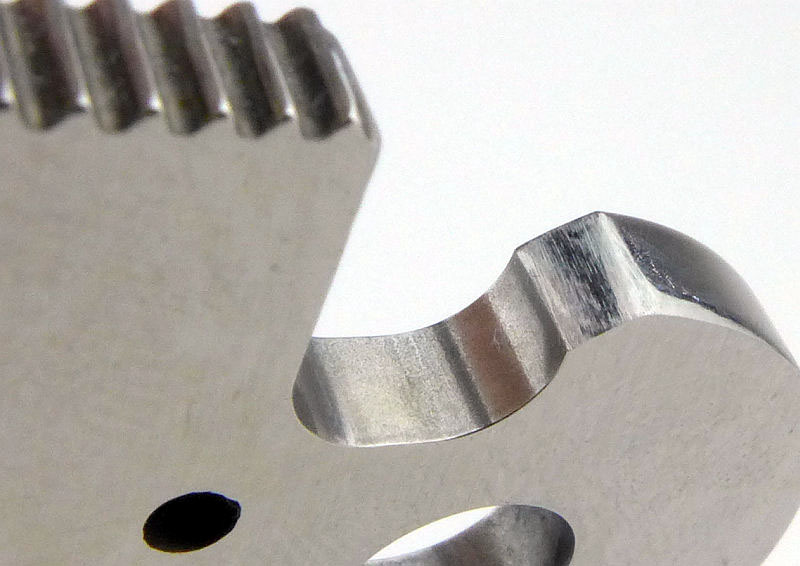 It looks like that initial break removes the burr that forms when removing the metal. Disassembling the knife once more shows the broken off burr on the lock bar. In case you didn’t spot it, looking closer it is the straight piece of debris bottom left of the lock bar surface closest to the camera. 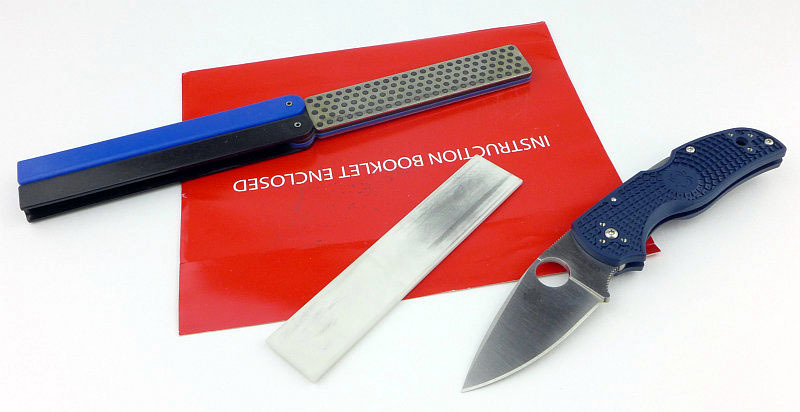 The tools used for this conversion (not including the screwdrivers) are a DMT diafold (Coarse grit) and a Spyderco fine pocket stone for the final polish. 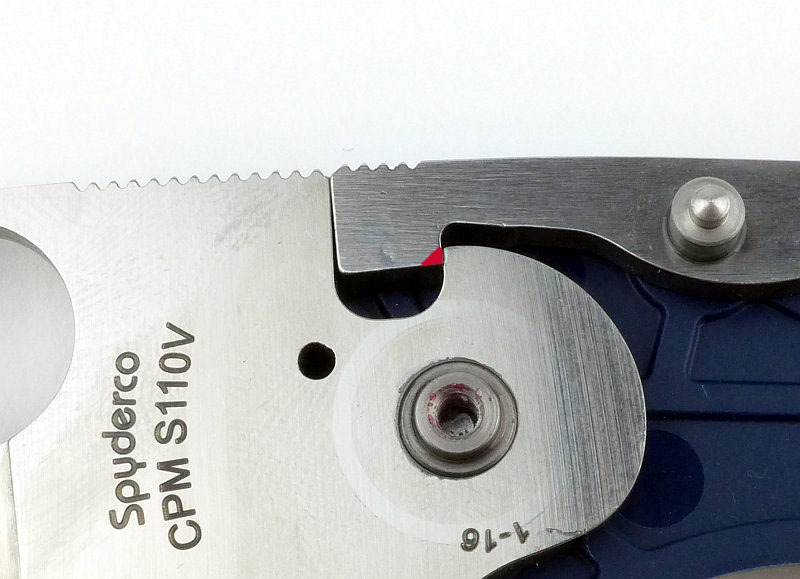 …and the ‘H’ shows how the blade is not fully open, but instead has a gap between the end of the lock bar and the blade. It is usable, but feels sloppy. If you follow the good conversion steps, hopefully you can achieve a successful conversion yourself.